Coal is first up in carbon taxing’s crosshairs for two reasons: its energy value comes almost exclusively from oxidizing carbon, whereas oil and gas burning also derives considerable heat from oxidizing hydrogen into harmless water vapor; and in the U.S. coal is used almost exclusively to generate electricity, a commodity that many other sources can make as well. 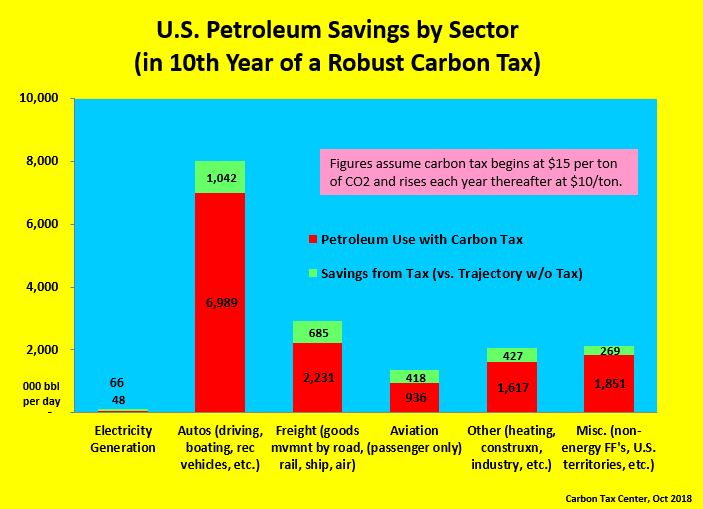 A decade after startup, a robust U.S. carbon tax would eliminate one-fifth of petroleum usage. But oil would hardly be immune. A U.S. carbon tax — not a token, Exxon-style one but a robust fee on fossil fuels’ carbon content that ramped up steadily — would, before long, put a sizable dent in petroleum use. Ditto, natural gas, as the carbon tax level rises still higher. A vigorous U.S. carbon tax would squeeze every owner of oil wells, petroleum infrastructure and hydrocarbon reserves: shareholders of Exxon, Shell, BP et al. ; the Koch Brothers; and, most of all, Saudi Arabia’s national petroleum and natural gas company, Aramco — the world’s #1 oil extractor and largest holder of oil reserves. The list of ways that a carbon tax would lessen oil use is nearly limitless. Driving, costing more, would begin to shrink. Fuel-efficient cars that stretch each gallon — higher-mpg vehicles and electrics — would gain market share. Freight movement by truck would start to be switched to rail and water, while supply chains became more local. Air travel would get pricier even as new aircraft engines were designed for greater fuel efficiency. In millions of economic decisions, proximity would be favored over distance and sprawl. Transit, cycling and higher-density development would gain. These changes wouldn’t happen everywhere or immediately, of course, but they would gather strength as the carbon tax ramped up and society’s defaults got reset. And while we can’t micro-model every behavioral and structural change from carbon taxes (there are literally billions), the rich academic literature of price-elasticity makes it possible to rough-estimate the aggregate impacts of raising the prices of petroleum products for households and businesses. In our modeling at the Carbon Tax Center, we estimate that a U.S. carbon tax that started modestly at $15 per ton of CO2 but increased each year thereafter by $10 per ton would, by its tenth year, shrink U.S. oil usage by 3.3 million barrels a day, cutting usage by one-fifth. That shrinkage amounts to more than 3 percent of current world oil consumption. A drop of that magnitude — even ignoring that many other countries would follow suit — would deliver a powerful one-two punch to Saudi pockets: lesser sales and a lower price. With less money to throw around Washington and the Middle East, the corruptive power of the Saudi regime would begin to diminish. 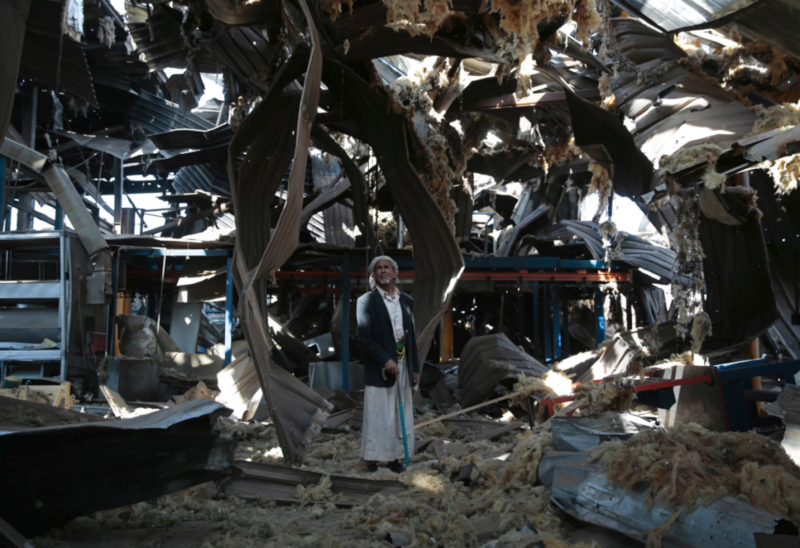 Its wherewithal to bomb Yemen back to the Stone Age, silence dissident journalists like Jamal Khashoggi, punish Canada simply for expressing “grave concern” about arrests of activists in Saudi Arabia, and so on — and immunize itself by spreading cash around U.S. universities, think tanks, artistic institutions — would be diminished as well. All of which makes another reminder that the benefits of taxing fossil fuels according to their carbon content go beyond even helping arrest climate damage. Human rights activists — indeed, everyone who wishes to see justice done for the brutal murder of Mr. Khashoggi — should join the movement to tax carbon emissions.